A knife-wielding man went on a deadly rampage at the heart of Britain's seat of power yesterday, smashing a car into pedestrians on London's Westminster Bridge before stabbing a police officer to death inside the gates of the country's parliament. Four people were killed, including the assailant, and about 40 others were injured in what UK Prime Minister Theresa May condemned as a "sick and depraved terrorist attack". This morning, Mark Rowley, the Met's senior anti-terror officer revised the death toll down from five to four - the attacker, Pc Keith Palmer, who he stabbed, and a woman in her mid 40s and a man in his mid 50s, who were mown down as the terrorist sped across Westminster Bridge in his car. He said 29 people had been treated in hospital with seven people in a critical condition. Mr Rowley said it was still his belief the attacker worked alone and was inspired by "international terrorism", adding that there was no specific information to suggest any further threat to the public. 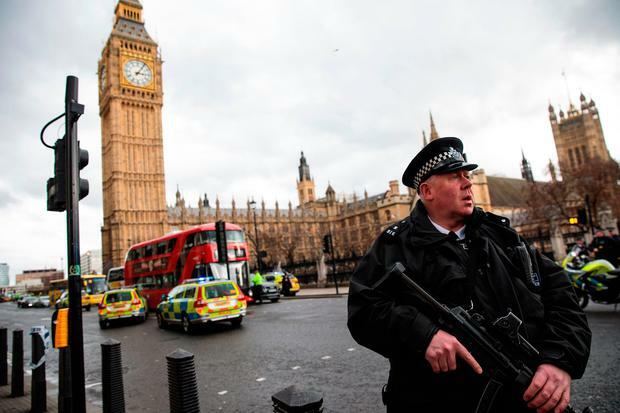 Lawmakers, lords, staff and visitors were locked down after the man was shot by police within the perimeter of Parliament, just yards from entrances to the building itself and in the shadow of the iconic Big Ben clock tower. He died, as did two pedestrians on the bridge, and the police officer. The fatally wounded policeman, who was unarmed, was named by Scotland Yard as 48-year-old husband and father Keith Palmer. A doctor who treated the wounded from the bridge said some had "catastrophic" injuries. Three police officers, French teenagers on a school trip and two Romanian tourists were among the casualties. Police said they were treating the attack as terrorism. There was no immediate claim of responsibility. Britain's top counter-terrorism police officer Mark Rowley said police believed they knew the identity of the attacker but he declined to provide details. Speaking outside 10 Downing Street, Mrs May said that level would not change. She said attempts to defeat British values of democracy and freedom through terrorism would fail. "Tomorrow morning, parliament will meet as normal," she said. She said Londoners and visitors "will all move forward together, never giving in to terror and never allowing the voices of hate and evil to drive us apart". Yesterday was the anniversary of suicide bombings in the Brussels airport and subway that killed 32 people last year, and the latest events echoed recent vehicle attacks in Berlin in Germany and Nice in France. Parliament was locked down for several hours, and adjoining Westminster tube station was shuttered. The attack began early yesterday afternoon, as a driver in a grey SUV slammed into pedestrians on the bridge. "I saw one person who gave no signs of life. One man was bleeding from his head," Mr Sikorski told Poland's TVN24. Ambulances arrived within minutes to treat people who lay scattered along the length of the bridge, which links parliament to the south bank of the River Thames. 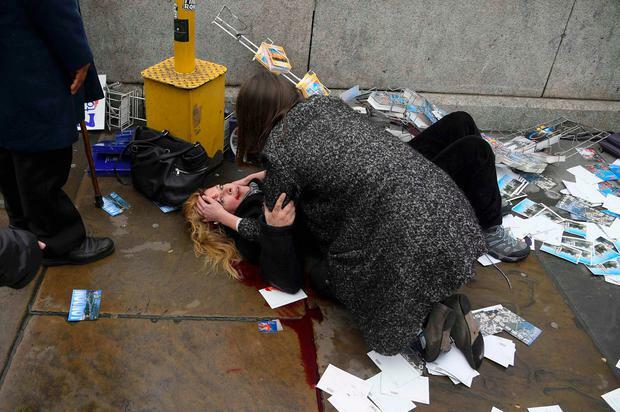 One bloodied woman lay surrounded by a scattering of postcards. The car crashed into railings on the north side of the bridge, less than 180 meters from the entrance to parliament. As people scattered in panic, witnesses saw a man holding a knife run toward the building. "The whole crowd just surged around the corner by the gates just opposite Big Ben," said witness Rick Longley. 'Daily Mail' journalist Quentin Letts said a man in black attacked the police officer before being shot two or three times as he tried to storm into the building. Mrs May was among lawmakers near the Commons at the time of the attack, and was quickly ushered away by security officers and driven back to Downing Street. Dr Colleen Anderson of St Thomas' Hospital said some of the wounded had "catastrophic" injuries. "Some had injuries they could walk away from or who have life-changing injuries," she said. Three French students on a school trip from Saint-Joseph in the Brittany town of Concarneau, two Romanians and five South Koreans were among the injured.